Chalkboard: They are laughing at me, not with me. 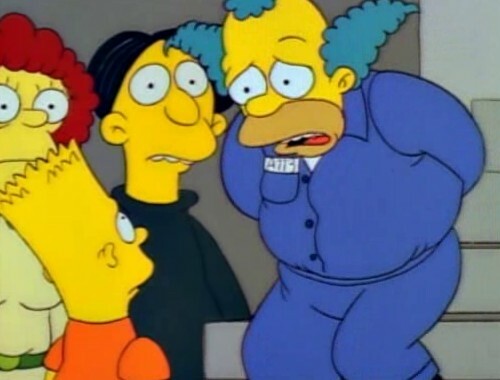 Plot: “Krusty the Clown” robs the Kwik-E-Mart. We see how Krusty’s incarceration affects his TV show and his biggest fan, Bart. • Krusty: Don’t blame me, I didn’t do it! — Woah, Bart ripped off Krusty’s catchphrase! • Great touch, when Homer steps on “Krusty”‘s foot, it’s SideShow Bob’s voice, then back to Krusty, as he’s impersonating Krusty. • Poor Homer being caught bad mouthing his sisters-in-law via security footage on national TV. • He’s publicly humiliated for hiding during a Kwik-e-Mart stickup, which I find in bad form. Why would you put your life on the line for a few hundred dollars? • Krusty (seen without clown makeup and looking haggard, sadly saying he didn’t do it – inadvertently repeating his catchphrase) is actually quite sad. • His lawyer is a precursor to Lionel Hutz: (upon losing the case) Gah! I knew it! This happens every time. • Every act starts with a version of Krusty’s opening: 1) The regular opening, 2) Krusty Behind Bars news special (which is hilarious!) and 3) SideShow Bob’s version, “The Sideshow Bob Cavalcade of Whimsy”. Amazing! • Marge calls Krusty an ‘insane criminal genius’? Eh…he robbed a convenience store and got caught immediately! • Bart and Lisa’s clue-gathering/sleuthing is both interesting and fun to watch. 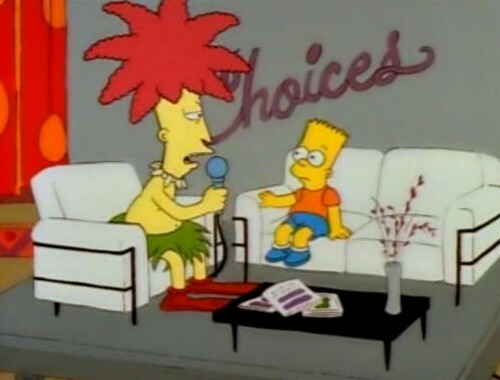 • Sideshow Bob’s “coming out” episode. He’s been in the background/TV previously, but he’s fully-formed here, and is a joy to watch. Bart (pleading with Homer): You’re giving in to mob mentality! 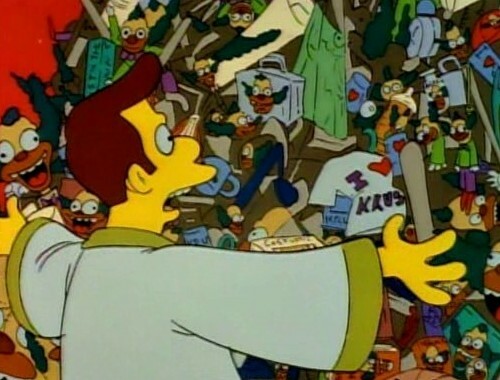 Homer: No I’m jumping on the bandwagon. Krusty’s opening schtick starts with “Who do you Love?”. Later, Side-Show Bob opens with the grammatically correct “WHOM do you love?”. I marked out! Sideshow Bob: I glad we’ve finally dispelled the myth that I’m too uptown for the tots. Overall: A fun who-done-it story. Kelsey Grammar has an amazing voice and delivery, and Side-Show Bob is an incredible character, basically an evil Frasier. A joy to watch. Excellent episode.